The machine comes with a silicon oil lubricating unit, thread spreading mechanism and thread trimming mechanism which trims the thread without fail, thereby consistently ensuring beautifully-finished seams for light- to medium-weight materials. The appearance of the machine is restyled, and it is now colored in a refreshing urban white. The thread spreader is for reverse feed stitching. It also plays an important role during normal feed stitching, helping create finished seams with higher consistency and preventing stitch skipping. 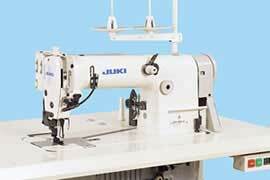 The machine is provided with mechanisms to enable upgraded sewing. draw-out mechanism enable the machine to leave thread of a uniform length after thread trimming, and prevent slip-off of the needle thread. All of these mechanisms contribute to upgraded sewing. 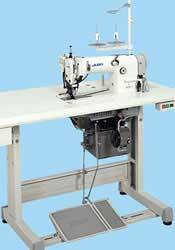 Safety stitching or reverse feed stitching with a simple lever operation. (back-tacking) can be alternated through the simple adjustment of the stopper of the reverse feed lever. Either sewing method can be used. Provided with a sliding presser foot and a silicone oil lubricating unit as standard, stitch skipping and puckering are prevented. Furthermore, the silicone oil lubricating unit prevents the needle from overheating, and allows foundation yarn or synthetic thread to be used without breakage during sewing. These features assure beautifully finished seams with consistency for light- to medium-weight materials. The machine finishes beautiful seams in elastic and light-weight materials. Furthermore, the differential-feed can be adjusted with the simple operation of a lever, thereby enabling the machine to respond to the requirements of many different kinds of sewing. Using a lever, the differential-feed ratio for stretch stitching or gathering stitching can be easily adjusted. The machine is capable of gathering and partial shirring. A gathering attachment (S060), intermittent gathering attachment (S061) and partial shirring device (PF5) are optionally available to enable the machine to perform consistent gathering and partial shirring. Replaceable gauges such as the gauge for light-weight materials and the urethane feed dog are prepared in accordance with the applications of the machine. The machine is best-suited for sewing elastic materials. The differential-feed is the best-suited feeding device when sewing elastic materials including double-jersey or light-weight materials such as satin or georgette. Beautiful, elastic seams are created, while puckering, thread breakage and thread fraying are all prevented. Change of sewing method with a simple lever operation. The sewing method can be alternated between stretch stitching and shirr stitching with the simple operation of a lever. This lever is also used to adjust the differential-feed ratio. 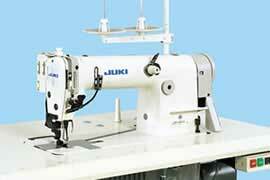 An easy-to-operate, high-precision presser foot, feed dog and thread draw-out mechanism have been developed for this sewing machine so that any operator can finish seams of the highest quality. The machine flexibly adapts to a wider range of light- to heavy-weight materials, process changes, and sewing specifications, including partial shirring.  The top-feed amount can be adjusted independently of the bottom-feed. The maximum lift of the walking foot is 3mm. The machine is also capable of performing partial shirring. The machine works effectively for processes which require partial shirring as long as the partial shirring device (PH-3) is used in combination with the partial shirring dial. The partial shirring device comes in two different types, the kneepad drive type and the pedal drive type. The top-feed dog has been designed so that the operator can smoothly place the material to be sewn on it. Furthermore, the gauge can be easily replaced and stitch adjustment can be performed without difficulty. The machine comes with a forced lifting mechanism for the top-feed dog. This enables the operator to place the material to be sewn on the top-feed dog more smoothly. The machine incorporates its exclusive chain-off thread presser pedal foot, which improves seam quality and ease of operation. The exclusive gauge comes in five different types, and the gauges can be replaced in a simple procedure. This facilitates the required adjustment when changing the needle count. The machine incorporates many functions and places a great deal of importance on higher product quality. The machine comes with many different functions to prevent uneven material feed and puckering for higher-quality seams. The machine is adaptable to a wider variety of light-to heavy-weight materials and takes full advantage of top-feed mechanism. This enables unskilled operators to finish seams of consistent quality. Slacks, pantaloons, ski pants Attaching waist belts, joining sides, seam insides, or hip seams. Coats, blazers Sewing the center of the back, joining sides, sewing sleeves, belts, collars, and sewing the facing on to the front.